Out of State Patrick Towles played his whole life at Kentucky, but he has arrived at BC for one final ride. Have you ever faced pressure before? Have you ever felt the eyes of thousands bearing down on you each Saturday, watching your every move? Playing in front of family, friends, acquaintances, and strangers in your home state, people who have known your name since high school? Have you ever carried the weight of an entire state that expects you to be its savior? 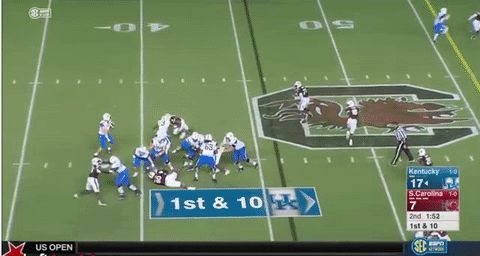 Patrick Towles knows that feeling all too well, and it nearly did him in. But Towles has a knack for extending plays. Just when it seems like hope is lost—the pocket collapsing, a herd of hungry defensive linemen barreling toward its prey—the fifth-year quarterback finds a way to stay alive. Towles can take a play that seems destined for failure, work his magic, and turn it into something special. He has the composure to envision big plays, and the skills to go out and make them happen. Towles has worked his magic on countless occasions to extend plays on the field over his career. His final act, if he’s up for it, will be extending his college football career at Boston College. Physically, Towles had every tool to succeed at the University of Kentucky, where he spent his last four years. At 6-foot-5, 250 pounds, he’s a big quarterback—not just big by human standards, but big by football standards—and he has an absolute cannon of a right arm. He’s got quick feet to escape the pocket and rumble downfield, and he’s nimble enough to shake-and-bake even the quickest linebackers for a first down. He sees the field well, throws with good accuracy, and has a level head on his shoulders. He’s not afraid to get in your face, but he’ll be the first one to congratulate you after a big play. It wouldn’t be a stretch to say that the pressure got to Towles during his four years at Kentucky. The perfect storm of familial and athletic ties to the state could be enough to crumble even the strongest mind. His grandfather is MLB Hall of Famer and former senator Jim Bunning, and his quarterback coach at Highlands High School in Fort Thomas, Ky., was former NFL quarterback Jared Lorenzen. “He’s as good of a high school player as I have ever been around,” former NFL wide receiver and current Sunday Night Football color commentator Cris Collinsworth once said of Towles. Collinsworth was right, because Towles was a star at Highlands—in three years, he lost just one game. He won a state title in each of his four years at the school and was named Kentucky’s “Mr. Football” in his final season. Needless to say, the hype surrounding Towles in Kentucky was sizeable. When it came time to select a college, there didn’t seem to be much of a choice. Towles’ parents met at Kentucky. His older sister went there. Once the Wildcats offered—even though he also got offers from Louisville, Vanderbilt, and Arkansas—it was essentially a done deal. Towles’s first two years at UK were tumultuous, and he played sparingly on youthful teams with crowded quarterback depth charts. Described by former Kentucky offensive coordinator Neal Brown as “goofy” at that time, Towles just didn’t have the on-field maturity necessary to win the starting job. It took two years—a major period of development both on and off the field—for Towles to win the coaches over. And now, even though he’s currently the head coach at Troy University, Brown still fields questions from scouts about a certain quarterback from Kentucky. “Everybody that comes through here asks me about Patrick Towles,” Brown said. It was easy to see why. When Towles finally got to see the field regularly as a redshirt sophomore in 2014, he flashed skills that amazed and became a fan favorite for his personality (as well as his hair). In his signature game, a two-score loss to No. 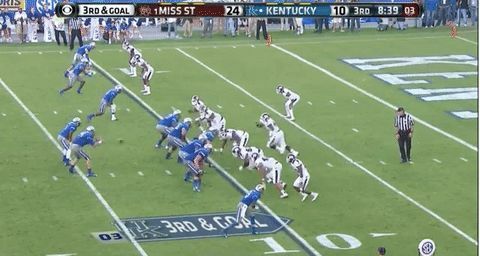 1 Mississippi State, the Kentucky offense torched the Bulldogs defense—one of the best in the country at the time—for 31 points. Towles threw for two touchdowns, ran for two more, and avoided turning the ball over. Kentucky is the place where Towles came to fame and succeeded his entire life. The only way he could continue to succeed, it turns out, was if he left. Toward the end of last season, Towles was unseated as Kentucky’s starting quarterback by freshman Drew Barker. The Wildcats struggled to a 4-6 record through the team’s first 10 games, and head coach Mark Stoops opted to get a look at the future by choosing Barker to start the final two games. For the second time in his college career, Towles was on the outside looking in. He was denied playing time as a freshman, fought for two years to finally get it, but had it snatched away from him just as his career started to wind down. So he did something he hadn’t really done in 20-plus years—he left Kentucky. After graduating from UK this past winter with a degree in political science, Towles consulted his family and his parish priest about where to go next. As it turned out, Boston College was the answer to that question. “It’s kind of like a bubble down there in Kentucky, and it’s nice to get out for a little bit,” Towles said. Towles is slowly adjusting to the differences between Boston and Lexington—colder weather, more walking, more frequent trips with Uber—but the people around him are making it a little bit easier. He has gotten along well with his teammates, and the coaching staff has been nothing but supportive. Just as Towles has so often received new life—in the pocket, in his career—he has also given it to those in need. A devout Catholic who cited BC’s status as a Jesuit institution as a primary reason for transferring, Towles recalled a profound experience from this past March that sticks with him today. On a mission trip to Jamaica, Towles met Stephen, a hit-and-run victim from Kingston who was essentially left to die in his wheelchair in the weeks following the accident. Towles’s job on the trip took him to the intensive care unit at a care center in Kingston, where he carried out daily tasks like transfers, bathing, shaving, changing clothes, and others. Of all the people in the facility, though, Towles instantly formed a special connection with Stephen, who, despite a laundry list of physical ailments, was very mentally sharp. They bonded through faith. Towles asked Stephen if he prayed regularly, and he did. He asked Stephen if he had ever been baptized, and he revealed that he hadn’t, though he would be interested. Well then, Towles said, when can we baptize you? Stephen replied, Well, how about now? And so, with the help of an on-site priest, Stephen was baptized right then and there. Naturally, Towles became the man’s godfather. Towles does, in fact, have a plan in place to return to Jamaica to reunite with his godson—after he takes care of some business, of course. “Hopefully I’ll go back in January, after our bowl game,” he said. After playing his whole life for everyone else, Towles’ move to BC seems like he’s finally playing for himself. He got out of his home state, leaving all the pressure that came with his family and his reputation behind. He switched jersey numbers from 14, which he wore at Kentucky to honor his grandfather, to eight. Though he obviously still keeps in contact with his family and his friends from back home, Towles begins his one-year tenure at BC with a clear mind and a full heart. He knows his stay in Boston is temporary—Towles’s best-case scenario is that he leads a retooling BC team to a bowl game, setting the tempo for the next regime. Like any grad transfer, he isn’t really part of the bigger picture, more a stopgap brought in to minimize the bleeding in the short term. When asked about what he wants his legacy to be at BC, Towles huffed, smiled, and reared his gaze to the sky. He gave an answer straight from the public relations textbook, but because it came from him it sounded completely genuine. “I just want to win football games,” Towles said. And win them he will, though he might lose a few along the way as well. For every few touchdowns, there might be a few interceptions. For every dazzling scramble and 50-yard heave downfield, there might be a miscommunication on a simple slant route. But through it all, the ups and the downs of a very long college football season, Towles will be at peace with himself, his game, and his new home on the East Coast. He knows that, if he wants to extend his career and legacy, BC is the place to do it.